Solution: Consider the mixture of propane, C3H8, and O2 shown below.Write a balanced equation for the combustion reaction that occurs between propane and oxygen. 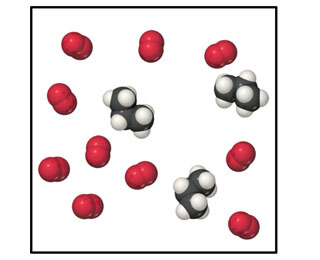 Consider the mixture of propane, C3H8, and O2 shown below. Write a balanced equation for the combustion reaction that occurs between propane and oxygen.